A groundbreaking new exhibit at the California Science Center features several prominent musicians including Sting, Pharrell Williams, Jack Johnson, Sheryl Crow, Ziggy Marley and Willie Nelson, exploring how they use their public platform as artists to raise awareness of vital global environmental issues. “Earth in Concert: Protecting the Planet Through Music” also features a multimedia exploration of tropical coral reefs, animal calls and habitats and examines the state of biodiversity in our oceans, grasslands and forests. A new composition by Jack Johnson about reducing plastic pollution in the ocean is also a part of the exhibit, and museum-goers can contribute verses to the song to do their part to inspire people to action. The exhibit, which is put on in partnership with the Grammy Museum and the Global Wildlife Conservation, kicked off with a star-studded concert featuring Ziggy Marley, Dwight Yokam and Judith Hill at Los Angeles’ Club Nokia on November 11. All proceeds from the concert benefitted Global Wildlife Conservation and the Grammy Museum. Johnson, who’s an avid surfer, has been an active environmental advocate for several years, often focusing his efforts on the world’s oceans and greening initiatives. He recently joined non-profit 5 Gyres to raise awareness of plastic pollution in the oceans and the deadly impact it has on marine life and ecosystems. Grammy-winning singer-songwriter Crow goes to great lengths to reduce the environmental impact of her tours, and often addresses issues of global warming and alternative energy sources in her music. 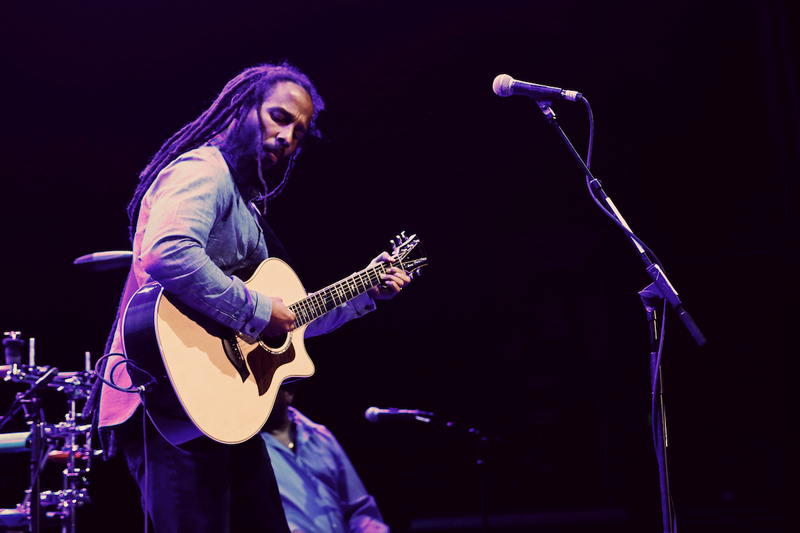 Reggae artist Marley has long been an advocate of treating the Earth with care, singing several pro-Earth anthems on his most recent album, Fly Rasta. Country music veteran Nelson co-founded the long-running benefit concert Farm Aid to help American family farms, farmers and healthy, farm-fresh food in schools, and owns bio-diesel brand Willie Nelson Biodiesel, which is made from vegetable oil rather than fossil fuels. Meanwhile Sting and his wife, Trudie Styler, co-founded the Rainforest Fund, which protects forests and the indigenous people who live in them from exploitation and destruction. Singer/producer Williams serves as creative director of Bionic Yarn, which uses recycled plastic to create yarn, and has partnered with clothing brand G-Star Raw to make stylish denim using plastic recycled from the ocean. The Earth in Concert exhibit will run for the next few weeks at the California Science Center and is free and open to the public.